In January 2016, ACR took over two more air traffic towers, Borlänge and Gällivare. In April, 2018 ACR will take over the air traffic tower of Göteborg Säve Airport. The competitive market in Sweden consists of 21 airports. 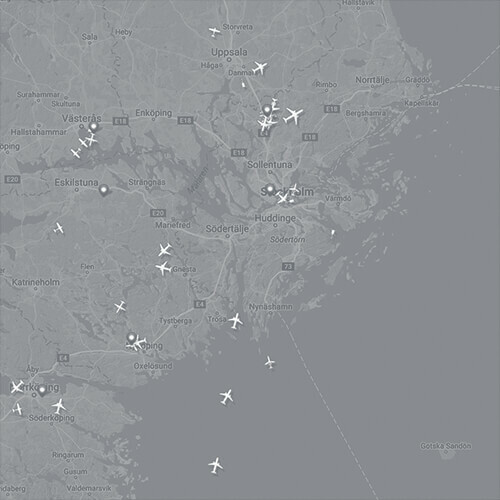 ACR operates air traffic at two of three Swedish airports, a total of 15 towers. In addition to air navigation services, ACR delivers expertise and consulting services, nationally and internationally. The environmental impact of airline traffic is of utmost importance to our customers. ACR's goal, together with our customers, is to reduce the environmental impact that aviation can have at airports and in neighboring areas. ACR is certified according to ISO 9001:2015 and ISO 14001:2015 and EU-certified for ATS and MET. The European interest in ACR is huge. Europe's leading Air Navigation Service Providers (ANSP) closely monitors developments in Sweden. ACR's strategic cooperation with Swiss Skyguide makes us a strong player in future European procurement. Read more in our folder. Cross-border strategy when ACR cooperates with Swiss Skyguide. The aim of the Skyguide and ACR cooperation is to strengthen its position on the international ATC/ANS market. Other countries in Europe will follow Swedish deregulation. The runaway costs for ATC/ANS in Europe during the last century is the main reason behind the EU regulation, making it possible for EU countries to open up to competition. There is an increasing demand for ATC/ANS cost-cutting measures within the EU. As evidenced in Sweden, a deregulated market for ATC/ANS has resulted in huge cost-savings for airports and airlines. Skyguide is a well-managed company with a long history within ANS/ATC and the sole provider for ATC in Switzerland. Both ACR and Skyguide have integrated civilian and military ATC, an established standard in Switzerland and Sweden since the 1970s. Flight safety through a continuous focus on a safety culture is of outmost importance for both Skyguide and ACR. Airports and other customers shall experience that ACR/Skyguide provides the safest and most cost-effective service in the market. Skyguide provides ATC/ANS in the Swiss airspace and in adjacent countrie’s airspace. Skyguide handles around 3170 flights per day in one of Europe’s most complex airspaces. Skyguide employs a staff of some 1.400 at 14 cities in Switzerland. The head office is situated in Geneva. Together, ACR and Skyguide make a strong brand. Since ACR entered the Swedish market, the theme of strategic cooperation has been part of our long-term plan. Together, ACR and Skyguide can offer qualitative and cost-effective services, where safety is of outmost importance. ACR is a member of The Swedish Aviation Industry Group, the Confederation of Swedish Enterprise and the Swedish Confederation of Transport Enterprises. ACR's ongoing CSR work supports the development organization Hand in Hand, whose vision is a world without poverty and child labor. ACR also supports the Children's Cancer Foundation, the Red Cross and Världens Barn. ACR is a member of The ATM Policy Institute.